The 2018 edition of the competition will be conducted under the theme ‘Made in Nagaland’, the reason for the theme being, products/ideas/services that are locally made are still very undervalued and lack recognition, hence its promotion and endorsement must be encouraged. We are of the firm belief that the competition undertaken with the theme will create awareness, promote and encourage our local entrepreneurs and give the participants the opportunity to not only partake in the competition and learn business skills but also give them the opportunity think out of the conventional ideas of business and to think “local yet global”. The competition is open to all undergraduate and graduate students. It is the prerogative of the college authorities to select team/teams from any batch and send their students for the competition. We believe participation in the event will benefit the institutions as well as the students since the competition involves a number of publicity activities which could go a long way in promoting the institutions that the teams represent. The competition dates are from 1st Dec to 10th Dec 2018. The students participating will have to be fully involved in their respective business activities throughout the day during all these dates. Along with the application forms, the teams must formulate a business plan and submit the plans 2 weeks prior to the date of orientation. Each team’s formulated business plans under the theme ‘Made in Nagaland’ must be submitted to youthnet1@gmail.com. After all the application forms and business plans are received, there will be a preliminary screening process. YouthNet will shortlist teams who can participate. More details may be required from the selected teams before the competition. A 2-day orientation on entrepreneurship will be conducted for the students where they will learn basic business concepts such as book-keeping, revenues and profits, sales and marketing etc. We believe the workshop will be extremely beneficial even if they do not pursue a business career in the future. After the workshop is conducted, the students should immediately start working on their businesses. YouthNet team will monitor and evaluate the progress of the teams. Any amount earned over and above the initial capital will be retained by the teams. The initial capital i.e. Rs.20, 000 will be returned to YouthNet at the end of the competition irrespective of whether the profits exceed the amount or not. A winner will finally be chosen after a detailed evaluation process. The result will be declared at the closing ceremony of the Hornbill Festival 2018. The winner will be chosen NOT based on profits alone but based on many parameters. The teams will be assessed on both qualitative and quantitative parameters which are: Novelty of Idea, Sustainability and Scalability, Revenues, Profits, Operations/Logistics Management, Cost Management, Time Management, Division and Management of Labour. Teams are encouraged to use products/services that are low cost so that the number of transactions and interactions with customers is high. We believe high interaction with customers will enhance the experience of the students. The businesses are to be undertaken in Kohima. 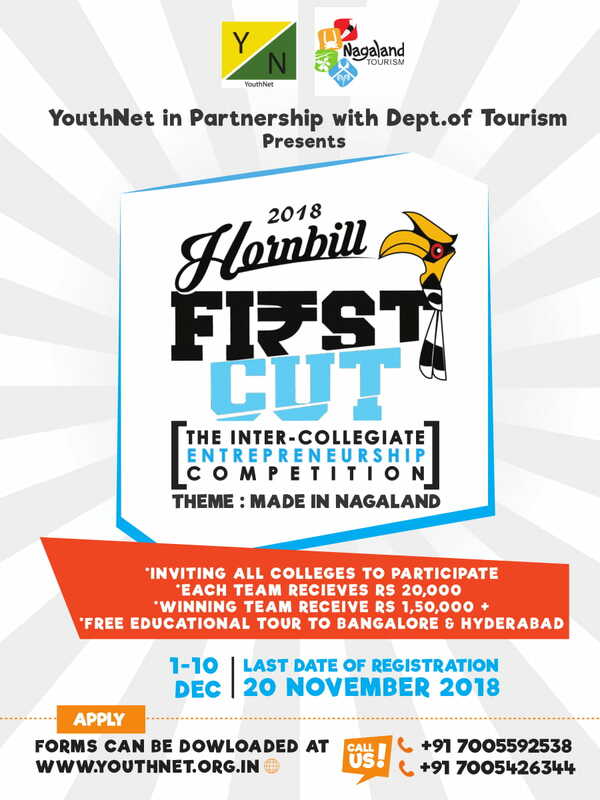 YouthNet will be reimbursing the travel expenses of the teams from other districts based on the receipts of expenses (5 x single person taxi fare). Teams should make their own accommodation arrangements in Kohima. There will be an entry fee of Rs. 500 per student i.e. Rs. 2500 per team. This will be used as part of the winner’s corpus. Only teams who qualify for the competition need to pay the entry fee.